The European Central Bank is phasing out the €500 banknote, in part because of its links to criminal activity. This marks the beginning of the end of the 500 euro bill. 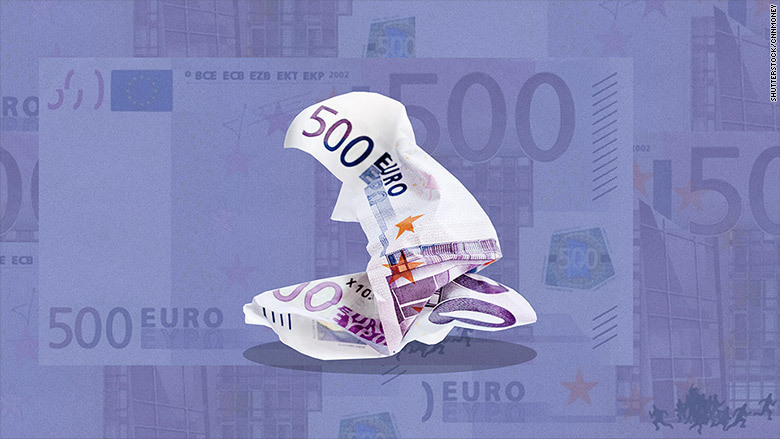 The European Central Bank announced Wednesday that it will phase out the 500 euro banknote because of concerns that this banknote "could facilitate illicit activities." "There is a pervasive and increasing conviction in the world of public opinion that high denomination banknotes are used for criminal purposes," said ECB president Mario Draghi earlier in the year in response to a journalist's question about the future of Europe's most expensive bill. The ECB is responsible for issuing euro banknotes that are used by all 19 nations in the eurozone. Europe's top law enforcement officials maintain that the 500 euro banknote (worth about $576) makes it easy for criminals to launder money since it's so easy to move around undetected. In a report last year, Europol said cash was still the "instrument of choice" for terrorists and 500 euro notes were in high demand, though they're not popular for everyday transactions. "The 500 [euro] note alone accounts for over 30% of the value of all banknotes in circulation, despite it not being a common means of payment," the report said. The bank said the issuance of the note will be stopped around the end of 2018, when a new series of banknotes is set to be introduced. The bank said the 500 euro note will remain legal tender and can therefore continue to be used as a means of payment and store of value. It said the bank note can be exchanged at the national central banks of eurozone countries for an unlimited period of time. The European Commission said earlier this year it would work with the ECB and Europol to find ways of stopping terrorists' cash flows.